Sharing folders in Windows XP is so much easier compared to Windows Vista/7 because of the Simple File Sharing. Simply right click on a folder, go to Sharing tab, check “Share this folder on the network” and anyone on the network is able to access the shared folder without logging in. When it comes to Windows 7, Simple File Sharing is no longer available and you will need to manually add the user and set the permission level. Setting the wrong permission level could be dangerous as it will allow unauthorized users to mess with the folder or files. Rather than checking everyone single folder if the permissions are set correctly, you can use NTFS Permissions Reporter tool which is a great time saver in automatically listing down NTFS permissions all the way down your directory tree. It is very easy to use NTFS Permissions Reporter. After installation, run it and by default it adds the C drive to the list to check on the permissions. It may take a very long time to scan the whole C drive so you can add the directory that you want to scan. Only the Exclude Directories option will work in the free version of NTFS Permissions Reporter. The filter option is only available on the Standard edition. Once everything is set up, click the Run Report button and it will start checking on the permissions showing you the users with permissions level in real time. There are two types of result format which is tree and table. When NTFS Permissions Reporter finished scanning, you can export the report to HTML format. 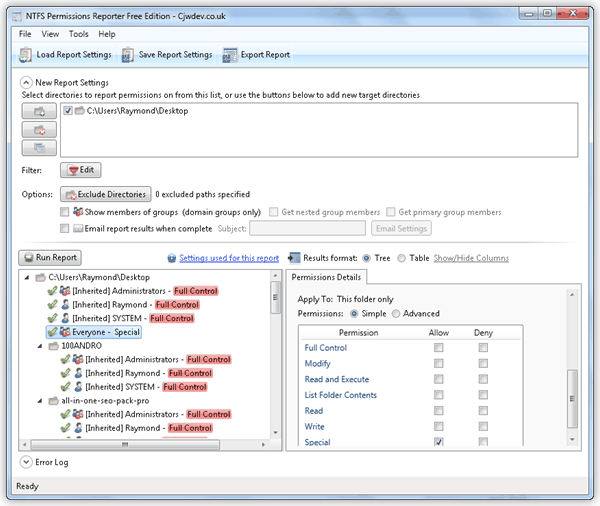 The report settings which you’ve setup can also be saved to that you can always load it back without reconfiguring the whole thing again. NTFS Permissions Reporter is a huge time saver for locating unnecessary or wrongly configured permissions to both normal users and IT administrators. It is similar to NTFS Permissions Reporter but has some more useful features and better report result view. Simple File Sharing is available still in Vista/7, just the setting is reversed. Search for “advanced sharing” and for your network profile (private/public), set “Password protected file sharing” to off.